Watching this film on TV, its stock ghetto story familiarity may overwhelm the nuances of its performances. The familiar story told in "Paid In Full," the story of a good ghetto kid seduced into the drug trade with tragic results, covers no new territory. But it's a story told so well -- with veracity, raw compassion, well-drawn characters and strong performances -- that its common cautionary tale feels as compelling as it might have been in the 1980s, when the film takes place and before this type of movie became its own genre. "Paid" plays as if it were made by people who lived it. People like Ace (Wood Harris), a reticent clerk at a neighborhood dry cleaners who has always been happy to blend into the woodwork and just be a survivor, even as he sees his closest friends becoming flush with cash, clothes and cool cars. "That ain't my flow, man," Ace says when his best friend Mitch (Mekhi Phifer) tries to lure him into his small-time drug empire. But as temptations mount (a local Colombian cartel middleman leaves him a cocaine "tip" in a jacket pocket at the cleaners), power becomes attractive (he'd like to get his sister away from her pimp-dealer boyfriend) and opportunities present themselves (Mitch gets arrested, leaving his street business up for grabs). Ace succumbs, in small increments, to the enticements of what seems like an effortless road to living well. What we know from the get-go, however, is that Ace meets an ugly -- if not deadly -- fate. The film opens with a scene one year later, when he's "running the neighborhood" but is still easy-going and keeping a low profile. The fresh-from-jail Mitch is his lieutenant, and his biggest problem is a loose-cannon enforcer named Rico (Cam'ron) who draws unwanted attention, flashing his cash and guns around. But being the top dog makes the once-invisible Ace a target for ambitious rivals, and within the first 10 minutes he's ambushed, badly beaten and shot. The balance of the movie is a flashback, which is a tired narrative technique. But director Charles Stone III (the man behind the "Whassup!" Budweiser ads) largely makes up for it with his otherwise capable command of both the cinematic language and the heart of the story. He exploits rap video clichés (babes and raining money for example) as ironic metaphorical imagery and puts the picture's excellent old-school hip-hop soundtrack to good illustrative use. He captures the unstable nature of the drug market flooded with cocaine in the '80s. He also culls such faithful performances from his cast that "Paid In Full" lures the viewer into the high-risk, high-reward lifestyle it depicts, just as the lifestyle itself lured Ace. 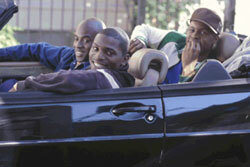 Wood Harris (best known for playing Jimmy Hendrix in a Showtime biopic) shrewdly preserves the essence of Ace's unassuming nature, even as he adopts a pimp walk, a flashy Saab and the power to control his corner of Harlem. Mekhi Phifer (who became a modern Othello in last year's "O") creates a sympathetic balance between struggling father (he has a young son with no mom in sight) and brutal street thug. And Esai Morales ("NYPD Blue") makes a strong impression in a pivotal role as Ace's Colombian connection, a smooth operator and a friendly mentor who lives richly but simply and inconspicuously as the source of the neighborhood's purest coke product. Cinematically Stone missteps once, by returning to the opening scene in a slow-motion sequence that feels as cheesy as a blaxploitation shootout. We already know what happens here. What's the point of dragging it out at half-speed? But the film does such a fine job of engulfing you in its world and allying you with its characters' choices, good and ill, that its shortcomings are remembered only as an afterthought.